23 Hour Plumbing are your plumbing professionals servicing all metropolitan areas of Adelaide, Melbourne, Brisbane and Perth. Leaking pipes can be not only, a major annoyance but they can also cause extreme structural damage to your property if left unattended for too long. In fact, in many cases, a slow leaking pipe can actually go unnoticed for a long period of time, especially if the pipe is under your properties foundations. If you suspect that you may have a leaking pipe, you could do a water meter check yourself for confirmation. A 10 minute test is sufficient, but it is highly recommended to run the test for at least 2 hours, or overnight if possible, to obtain a full account in the case of a slow dripping leak. Before you conduct the water meter test to check for leaking pipes you need to ensure that all taps and other water using devices are turned off and must stay off during the test period. At the beginning of your test write down the numbers showing on your water meter, after you have waited the appropriate amount of time (again, without using any water during the period) check the numbers again – if the numbers have risen then this is a sure indication that there is a leak somewhere on your property. Some water meters do not have numbers but rather a clock like device – but the same principle still stands, if the numbers have increased then a leak is present. It is advised to conduct periodical water meter checks yourself to safeguard your property against undetected water leaks. Once you have confirmation of a leak, or even if you just suspect a leak, call in your leaking pipe experts from 23 Hour Plumbing. We are the specialists in leak detection and pipework repairs and replacements. Never attempt to fix a leaking pipe yourself if you are unqualified, doing so could cause far more damage to your property and could risk any insurance claims that may have been viable, as well as void any warranties if the leaking pipe is in regards to your hot water system, dishwasher, fridge or a gas appliance. What causes a leaking pipe? Leaking or damaged water pipes can occur on any property at any time. Our pipes are resilient but certain factors can cause pipe leakage. Tree roots are known to be the leading cause of leaking or burst pipes. Trees roots thrive on moisture and nutrients and if there is the slightest crack in your pipework a root will quickly find its way in and will soon grow to a large mass, ultimately blocking your pipe or damaging the pipework and causing a leak. Other factors of leaking pipes are from the age of the pipework, corrosion, incorrect installation, rodent damage and blockages due to non-biodegradable items such as hair, food scraps, fats and oils, paints and chemicals and sanitary items to name a few – you will be amazed at some of the things we have found in pipes! Our Plumber utilise high tech equipment such as CCTV cameras to inspect your pipes. This method allows us to exactly pinpoint the location and cause of the leaking pipe and allows for a prompt and efficient pipework repair. Our plumbing professionals will always attempt a pipe repair in the first instance, in some cases a repair may not be possible due to the extent of the damage or the age of the pipework and, in this instance, a replacement will be required. We will always provide an on-the-spot, no obligation, quote prior to attending to any pipework replacement works. When you enlist the plumbing services of 23 Hour Plumbing you do not need to concern yourself about the cost. We understand that all financial situations differ and in most cases a leaking or burst pipe was the last thing you would have been expecting. Therefore, we offer our customers interest FREE payment plans* to ease any financial stress that an emergency plumbing requirement may cause. It is imperative that you have a leaking or burst pipe repaired or replaced as soon as you realise there is a problem. Not only could the water damage cause mould and structural issues within your property, but a leaking pipe has been known to be a major contributor to ground contamination and groundwater and waterway pollution – especially if you have a leaking sewer pipe. Be mindful that a small pinhole leak could eventually cause your pipe to burst – and a burst pipe is the last thing that you need, especially if it could have been prevented upon first signs. 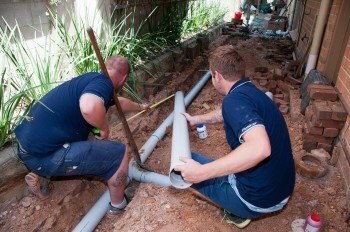 Book your leaking pipe plumber online or call us anytime on 1300 070 399.